The Philly 2 ensures people with the preference for a loose fit jeans can still ride safe on two wheels. By offering three washings Rev-It! ensure detailed style preferences can still be carried out without sacrificing on motorcycle-ready protection. CE-rated SEESMART™ protectors are included on the knees, with the option to add them to the hip area as well. Thanks to the versatile character these Cordura® denim / PWR | shield combination jeans are ready for anyone to take to the road. 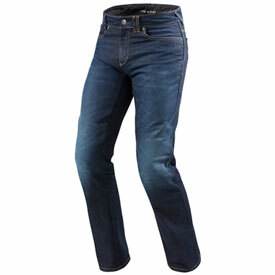 Outer shell: 12.5oz Cordura® denim with COOLMAX® element. Composition: Outer shell: 50% cotton, 30% polyester, 20% polyamide. Lining: 50% cotton, 50% polyester. Protective layer: 100% polyamide. SEESMART™ CE-level 1 protection at knee, prepared for SEESMART™ CE-level 1 protection at hip, double layered with PWR|shield at seat and knees, safety stitching at inseam. Safety stitching at inseam and comfort seat. Extra comfort by mechanical stretch of the outer shell. Moisture-wicking function by Coolmax® element.